Home » Grind 'n' Roast » Five tips on using your first coffee bean grinder: Warning … a blade grinder! For most coffee drinkers discovering different types of coffee beans, the coffee bean grinder with blades are their first experience with grinding coffee. And it does provide a satisfying improvement over opening and using ground coffee brands! This article provides some tips on using your first blade coffee grinder : including ‘doing the shake’, watch your timing, not too long/short, and ‘feel its pulse’! Lastly, I’ll end with some things you should be aware of… SAFETY first. The Coffee Blade Grinder Comes sharp! Typical coffee bean grinders are usually most people’s first choice as a grinder, as it was mine. Unfortunately, the blade doesn’t grind as such; it tears and slashes the beans into smaller pieces until the grind level is achieved. You’ll notice when you first open the canister that the grind is uneven as the grind produces a finer powder-like granules towards the outside, with unbroken larger pieces left inside. You can compensate for this by slightly shaking the coffee bean grinders as you press the switch. Don’t shake too much, or perhaps the cover will fly loose, creating a coffee cloud! I know it happened to me. By shaking the grinder gently, you will move the grounds around more and ensure a smoother grind overall. 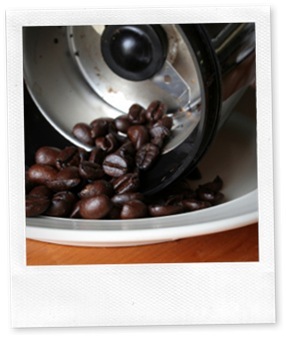 Another tip for using the coffee bean grinders with blades is to make sure that you don’t grind too long. The blades tend to create a little heat from the friction of blades on beans. This could be undesirable as the heat may impair some of the gentler flavors of the beans, and produce a less than optimal taste. To overcome this, I usually use pulses: I press the button for between 2-5 seconds at the most, then when the motion stops, I pulse again. Between pulses, I will shake the grinder a little to move the bean grounds around. If you are making coffee for a French press, then a coarser grind may be about 5-7 seconds. For drip coffee makers, you will need a finer grind, so experiment with changing the total grind time. You may be able to get a really fine grind with a longer time, but you will need to experiment with your grinder. Always hold on to the lid, just in case it comes loose. While these units don’t tend to have this issue, a little carelessness may result in a messy accident. Some blade coffee grinders are pretty basic: in other words, the lids or covers may fly off spilling coffee all over the kitchen! If you have one of those, always hold onto the lid properly while grinding, don’t shake too violently up and down or it will fly off! Trust me! These techniques work very well with smaller handheld electric grinders, but if the grinder you use is larger or static, or you have hand mobility issues, then these options may not be suitable for you. The larger machines may also have preset grind levels making this pulse, grind and shake ritual impossible. Uneven grind: if you are unfamiliar with grinding levels, you will have to experiment with the different coffee grinds for your equipment. So there’s a little learning curve. Safety First: NEVER use a coffee grinder that can grind beans WITHOUT a cover on… Those blades will happily grind little fingers or anything else that gets put in. Should you decide one day to upgrade your grinder, just clean the blade grinder and let it grind spices for you! Saves you buying a new machine, and your cooking will improve, too! The coffee blade grinders are a good entry point for making whole bean coffee. Have a look at blade coffee grinders at Amazon. Check through the user comments as they can highlight what the grinders can be really like.